Another lovely species is Banksia occidentalis (picture right) a smaller growing banksia, to 2 -4 m or more depending on conditions also known as the Red Swamp Banksia. A very ornamental flowers. It grows well in cool to temperate and Mediterranean type climates, however not in tropical or humid areas. Native to the south coast of Western Australia the bright red flowers in summer and autumn make this an attractive addition to the garden. Like all Banksias B. occidentalis has no Lignotubers, so hard pruning is out as it will not reshoot from the base. Propagation is generally from seed, germination is quicker with heat treatment. 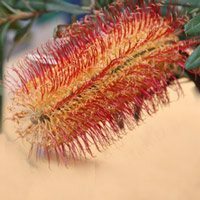 Preferring a moist soil Banksia occidentalis also requires protection from frosts. Find a depression or hollow in the garden where moisture collects for good results. Well drained soil although it will cope with periodic inundation as the common name suggests. Slow release native plant fertiliser in spring. Very attractive to birds for the nectar it provides. B. occidentalis is also widely used as a screening tree, and is very popular for flowers which as often cut and used in arrangements. This is species that is propagated mainly from seed. From seed to flowering will take around 5 years. Height – Varies from 3 to 7 metres with a dwarf form available. Spread – Varies from 2.5 to 5 metres. Flowers – Yellow to Red. Flowering Time – Spring although it will spot flower through the year. Foliage – Deep green with an open habit.